Who is ready for some fun with science? All of my boys are different and they each enjoy different things. But one thing I have found that pulls us all together to spend some fun times is STEM activities! the entire family seems to get involved somehow and they talk about it for weeks. So I thought it would be fun to share some of our activities and experiments with you all. This first experiment is super fun! 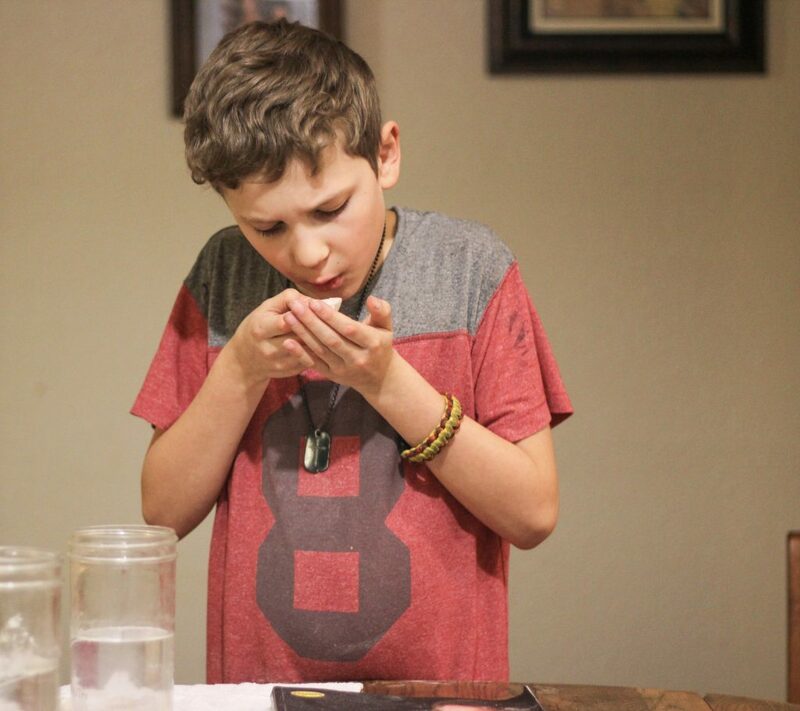 Your kids will be able to preform a magic trick for family and friends! Imagine the faces, when your child pulls a folded egg out of their pocket and proceeds to make it look normal, then fold it again and walk away! The first thing that we did was put a small hole on each end of the egg. 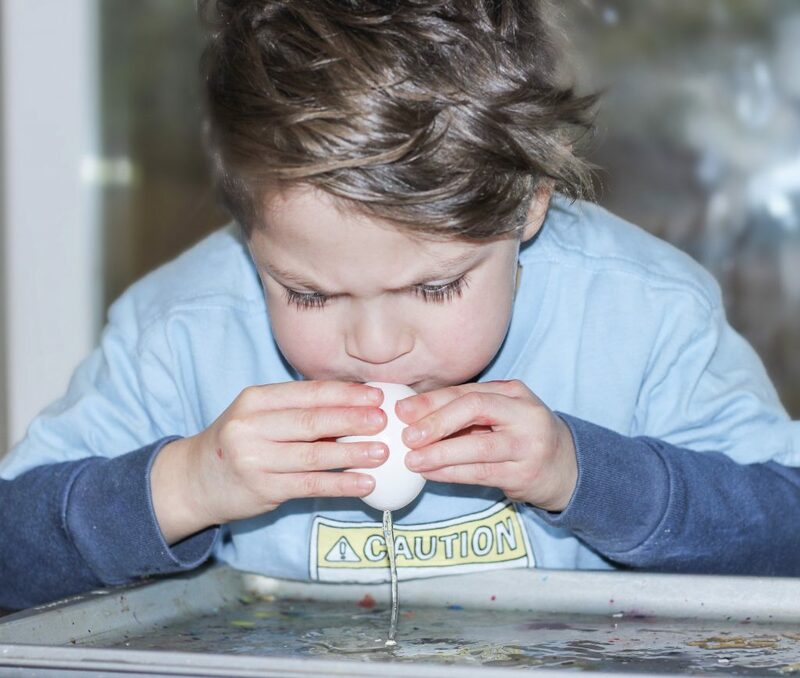 This could be a challenge for littles but also bring a lot of laughs, so make sure that you have extra eggs handy. we used a small skewer and started the hole on each side, before putting it through the entire egg. After you’ve made the skewer go through, have the child blow on one end with all their might. This will make the egg insides go out the other end. My boys thought this was hilarious and they were all able to do it without help. 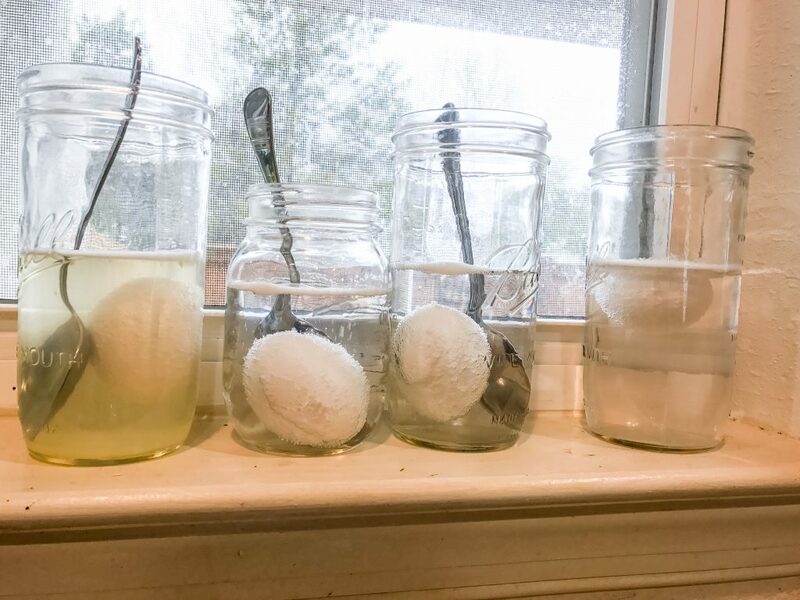 Once we had our 4 empty eggs, we poured white vinegar into mason jars and dropped our empty eggs in them. 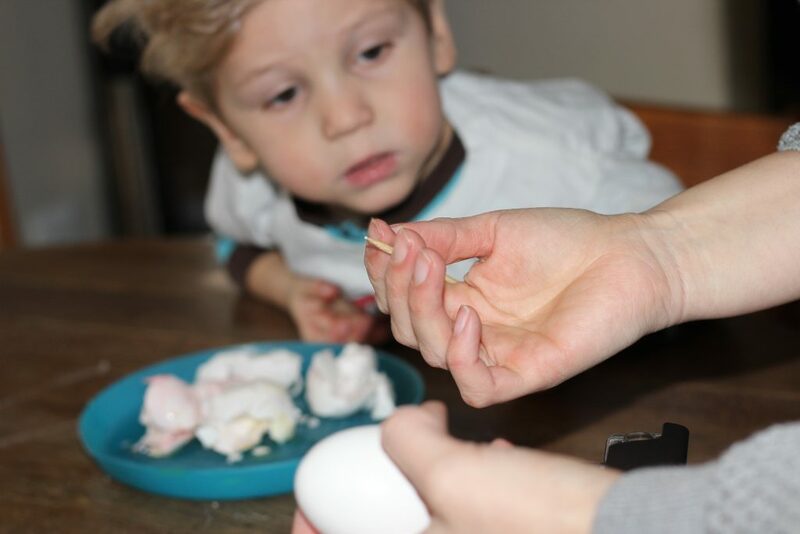 Since they are filled with air, they will try to float, you can have a talk with them about floating objects here if you want, and then we used spoons to carefully push the empty eggs down until they were covered. Now for the fun part! Ok not really. Waiting is never fun! 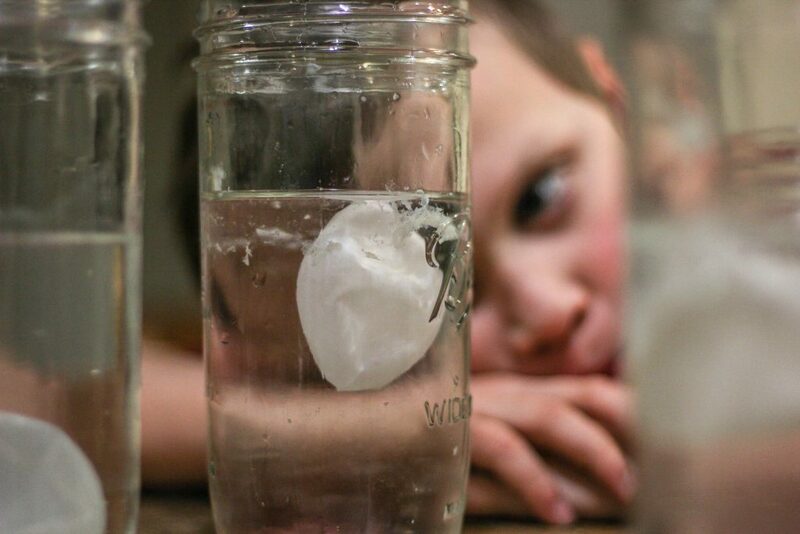 But we had to leave our empty eggs in the vinegar for a few days. We have a little one, so I put them on a high place that was still visible to everyone. That way they would see it every morning and the baby would not be able to have too much fun with it. During this time we were able to observe and talk about what was happening, and what changes they could see, they were able to speculate why things were happening and then find out if they were right or not. 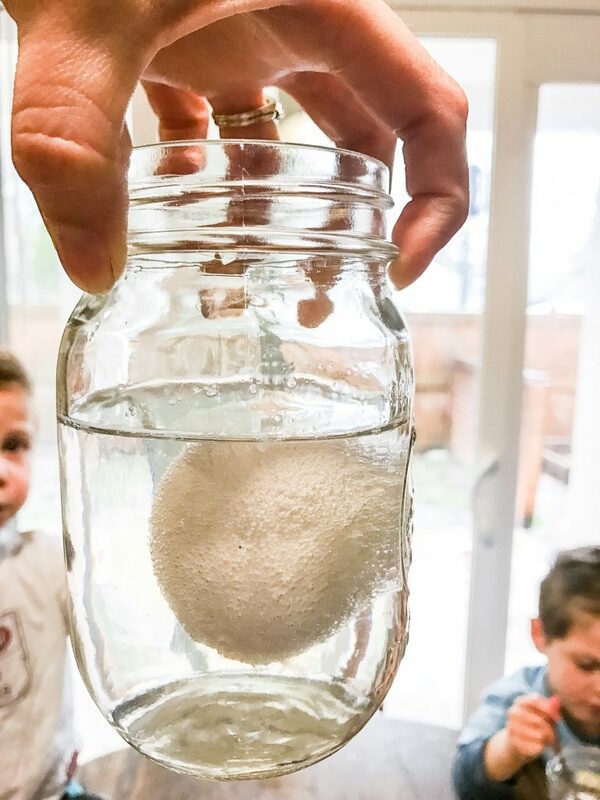 We learned that the acid from the vinegar starts a chemical reaction with the calcium from the egg’s shell as soon as it touches it, and it can keep going for days. Each egg is unique, so there is no rule for how many days it will take, but it should not be longer than 12 days. 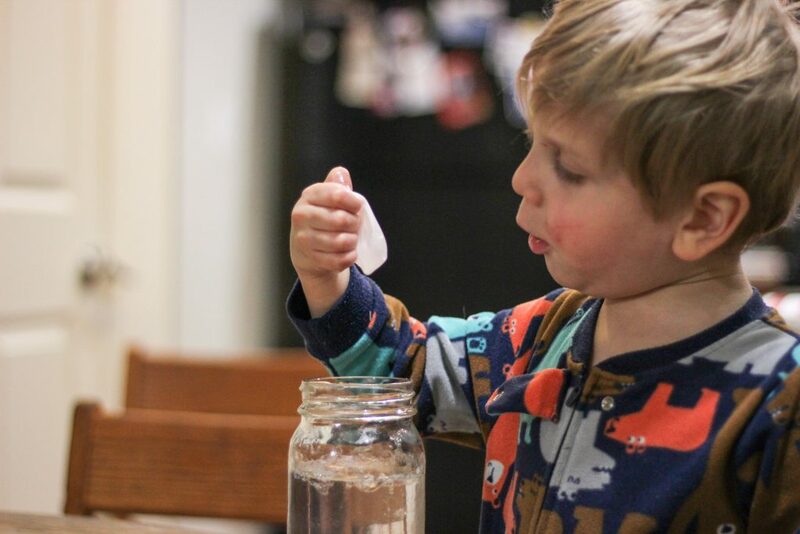 Depending on the age of your children, you could always go deeper into this chemical reaction! One of my favorite things about STEM is that it can be for everyone, and each child can go as deep as they can or want into the knowledge and experiences that come with each activity. On the next photo you can see how each day, the vinegar eats away more of the egg shell, until it will eventually leave only the inner membrane of it, which will be our folding egg. After about 5 very long days, it was finally time to take what was let of our empty eggs, out of the vinegar! Imagine the eggcitement!…. See what I did there? 😉 We stole the baby powder from the baby’s room and took those babies out of the vinegar. Insert happy dance and super anxious laughs here. Look at that concentration face! Remember, you have to be very gentle and careful, because if you go too crazy it will break 🙁 And then you will have to start all over again! One of ours actually broke, so I was very grateful that we had used more than one egg. 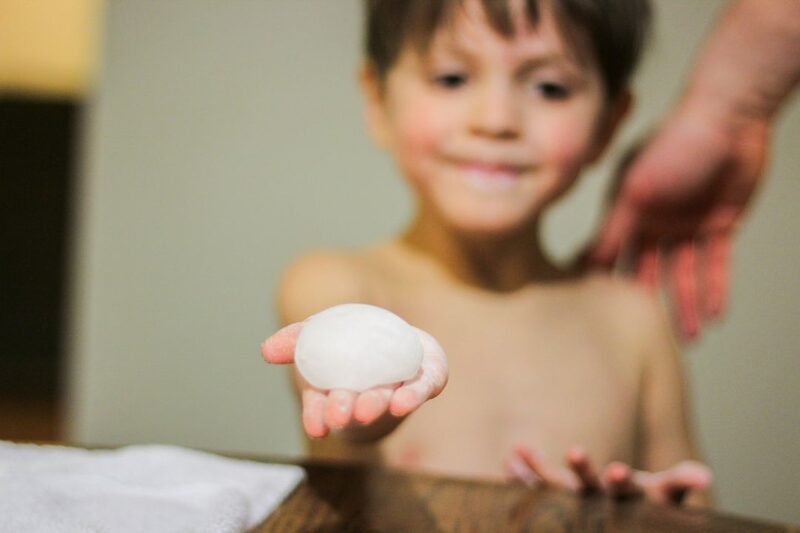 After having the egg out, we rinsed with water. Ok so we put baby powder on our hands and put our eggs on our hands. Then very carefully bounced it from one hand to the other, and blew softly on one end so that it would fill up with air, which made it look like a real egg. And there you have it! the kids had so much fun folding it, by pushing the air out of it softly with one finger and then folding if in half and then again. Their friends were super interested in trying it too. You are now part of our amazing egg club. 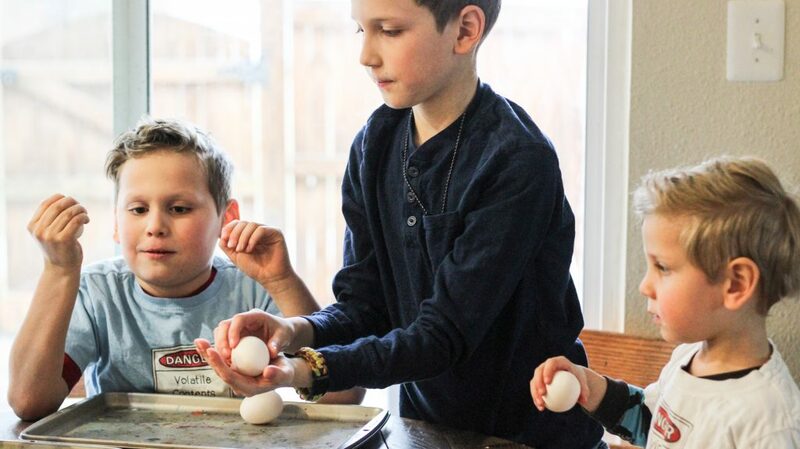 The boys are super into finding so many ways of experimenting with eggs that we have to buy extra eggs every week! we will make sure to share more of the fun experiments! 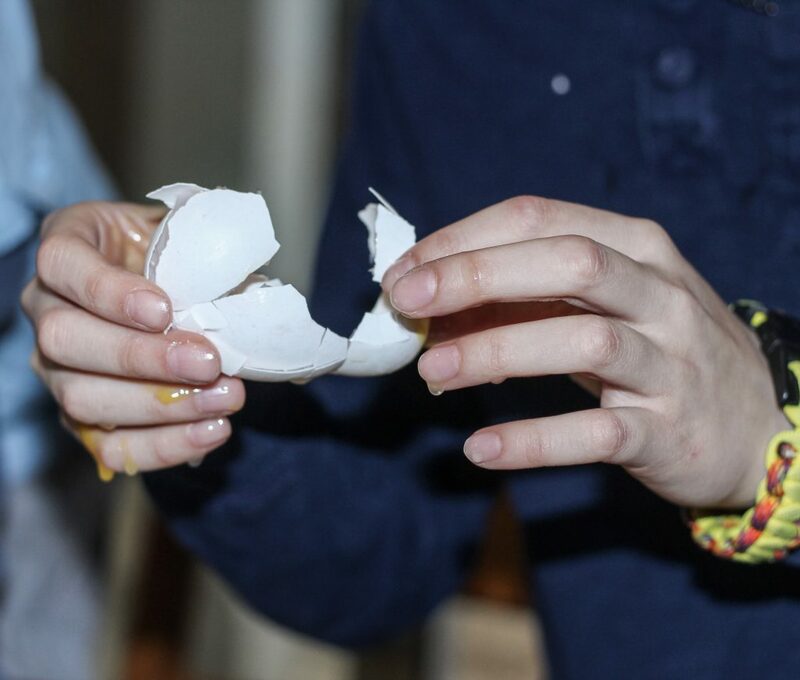 Will you try the folding egg trick? I think you should! And then come back and tell me about it! Did you discover something new? I think you will be happy with how STEM brings the entire family to the table and nobody will be missing the screen for a long time. Oh this looks so fun!!!! I can’t wait to try this with my girls! Looks like lots of fun. That looks like a lot of fun!!!! This is so cute and interesting. I didn’t know you could even do that.